This adapter has a mini DisplayPort (mDP) connector on one end for connecting to the output of your MacBook, MacBook Pro, MacBook Air, or any other device with an mDP output. 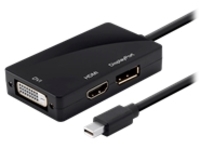 The other end has DisplayPort (DP), HDMI, and DVI output ports, allowing you to connect to a single display using either of these standards. This adapter saves you the hassle and expense of purchasing and transporting different adapters with your MacBook because this one adapter fits all the primary standards you are likely to encounter in your travels.